Resilience means different things to different people. For many in the international development and humanitarian communities, building resilience means responding to growing climate risks through disaster mitigation and planning. But for people like Birhani Fakadi, a 39-year old mother of 11 in rural Ethiopia, it also means access to reproductive health and family planning services, says ECSP’s Roger-Mark De Souza in this week’s podcast. A reality check is needed, he says. This year the global population is expected to grow by 82 million people, and the fastest growing areas are often the most vulnerable to climate impacts. “These shocks will be quick hits, so we need to think about how we respond quickly. But how do we set the base for longer-term mechanisms to deal with these shocks and stressors over a period of time?” Population dynamics, climate change, and the connections between food, water, and energy are all part of the equation. 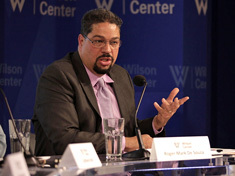 Roger-Mark De Souza spoke at the Wilson Center on April 23.